Claro Energy is at the center of the new initiative, piloting an “irrigation-as-a-service” business model in Bihar state that is already being used by dozens of farmers, according to the company’s head of Institutional Business, Sonal Adlakha. 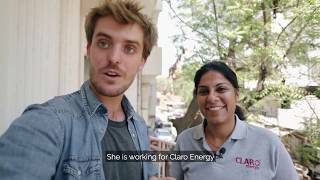 Claro, in collaboration with Smart Power India (SPI), an initiative established by The Rockefeller Foundation, is also working with private utilities at about 10 mini-grid sites, including Husk Power Systems and other SPI partner developers, and is experimenting with how irrigation can serve as an “anchor load” for existing or new mini-grids. Besides the new technology and service platform, Claro is also working at the grassroots level to help farmers adopt better practices, and efficiently utilize the electricity generated from solar panels to uncover further opportunities. For example, Claro is advising farmers to incorporate a third crop to their normal rotation of two crops, during previously fallow months. In an emerging economy such as India’s that is largely comprised of rural areas, and heavily dependent on the agricultural sector, such interventions could pave the way to improved livelihoods.